It is important to be informed about the resources available to people with autism when traveling to help make the travel experience as positive as possible. While families with individuals on the autism spectrum will often avoid vacations, by using resources like the ones provided here by TSA you can vastly improve everyone’s experience: the individual with autism, TSA agents, yourself, your family and other passengers on the flight. Know what to expect before you get to the airport. There are lots of different ways that you can stop potential problems before they start, or at least find ways to mitigate the risk. Being prepared is always going to be a big part of every successful vacation with an individual with autism. Passenger Support Specialists are available for anyone with disabilities, medical conditions or other special circumstances. Call 855-787-2227 at least 72 hours prior to your trip. 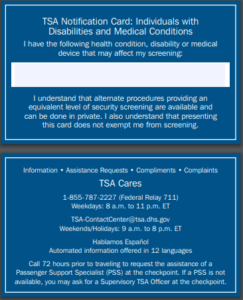 A disability notification card helps TSA agents know what to expect so that they can better serve individuals with autism, cognitive disorders, or other challenges. 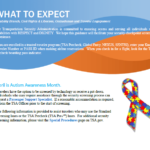 This will help the TSA agent to adjust their expectations so that your family isn’t treated differently for having someone who is on the autism spectrum. Hope these tips help to make your travels to go smoothly.